'Complex AI to Lead in Complex Times'. Gens and Doceo take on the challenge of distributing NEoCLEAR, the free, limitless energy deposited on Earth by Asteroid Raca. In the face of risk brought on by uncertain, Fast Fail Artificial Intelligence, Gens will not act until there is a plan to responsibly distribute NEoCLEAR. He will not allow any AI to take the limitless NEoCLEAR Power and NEoENERGY for its own illicit purpose. Project BeeANNTium provides the most incredible Bio-Geo-engineering solution for this, and other challenges accepted by Gens, Doceo, and now Ravi, the latest genius-scientist to join Pismire. From the Trio of Genius or TRIGEN continues the great purpose of Adaptable NEoNature Technology. NeoNature Publishing (Smithwick Books) and Chapters/Indigo Southpoint are pleased to announce the incorporation of Mitchell Baker's 'Adaptable NeoNature Technology' series into the Natural Sciences curriculum at the University of Alberta, Edmonton, Canada. To support this achievement, please join the author and guest lecturer Mitchell Baker, as he presents for conversation and signing, the first six volumes in the ANNT Series to include Axiom, Terraca, NEoCLEAR, and the newly released SpANNTium (5) and ANNTelligence (6) novels. Garrett created a happy, positive character he named Garrett Guy. Together, Garrett his Father, Mother and Grandmother spend family time together ... as Garrett brings Garrett Guy to life for all the family to enjoy. ​The Family Time with Garrett Guy story is a book written to bring children, parents, and family members closer through the sharing of family time activities that may include creating characters, drawing, painting happy and positive characters having fun doing all kinds of activities under the sun. The Family Time with Garrett Guy book is designed for older family member to read and share Garrett's story and artwork with younger family members. 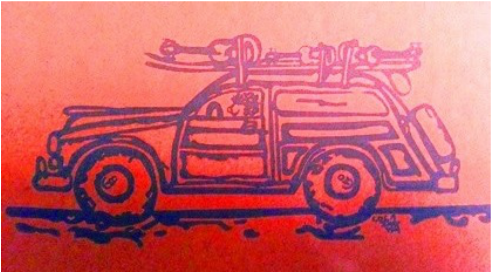 The colorful drawings and artwork created by the father and son team of Mitchell Baker and his son Garrett Baker. The Lake People Publishing Group, International, an Imprint of Smithwick Books, is proud to present this long anticipated family book in time for Christmas 2017. Volume 6 of the ANNT Series Adaptable NeoNature Technology works with Mother Nature to Solve the World's Super Questions. Looks like a reader was catching up with their G. Mitchell Baker book reviews ... here are four that posted recently ... So very Thankful for the appreciation expressed by my readers... G. Mitchell Baker. After about fifteen years of writing... this Letter represents the beginning of my life as an Author... July 2001. ​In brief introduction, I am a much published author with three books in print, and hundred of other commercially published credits including short fiction, medical technical research, behaviour profiles, case studies, investigative reporting, etc. I have known G. Mitchell Baker in both a professional and personal station since January 1993. Through experience I've found him to be a highly competent attorney; and as a friend, he is the best you will find. As a behaviour scientist and therapist, I have on more than a few occasions during the past twenty years worked in a liaison capacity with federal agencies. This experiential history allows me certain insights into the workings of these agencies. Because of this, I am in a position to say that Mr. Baker's character and plots involving same are very accurate. Sometimes they are alarmingly accurate. Mr. Baker writes oon several levels. HIs more dramistic suspense work definitely requires a thinking and mature adult audience. On the other hand, a couple of his screenplays are light comedy family pieces, and remind me of Touchstone Picture prodictions. I very enthusiastically recommend you add G. Mitchell Baker to your client list, and I believe you will find his written work is varied enough to address several different markets. The Letalis Edition of D.V.M. is definitely not predictable nor is it a typical paranormal story. On Father's Day ... it became a privilege to deliver letter 'Passion From Law To Writing’ to kids about career, inspiration, & passion for writing. Contemporary Fiction for young readers. ​From SMITHWICK BOOKS, through its Imprint, The Lake Publishing Group, International ... Watch for the English version of this novel for Young Savvy Readers and its availability through Amazon's Global Networks, and will be available to Libraries and Booksellers the world over. Letalis Books Edition of Lethal Believers D.V.M. Why there will be a Letalis Books Edition of Lethal Believers - D.V.M. A Very Believable Lethal Twist!! Just when you think you have read every possible story line or plot, a new twist of events and scenarios appears. “Lethal Believers D.V.M.” is an intriguing, well written story that will have you in the saddle riding Random with ease and roping steer with Evan. You will find yourself tearing up over Danta's deceased Pauline...or is she? You will cry for The Innocents and grow to have a very deep hatred for Dr. Gray Simmons and his staff, who do nothing to help. The scene with Random is so real, so heartbreaking, so emotional that I'd suggest Kleenex. It is a rare author that can make me scream “NO!” out loud while reading. Believable characters melded with an excellently interwoven plot make this a "must read" and a very difficult book to put down once started. G. Mitchell Baker writes with a style that gives an awesome visual of the characters as well as the surroundings. Congratulations on an excellent book! Arlene R. O'Neil reviewed Lethal Believers - D.V.M. Jon Emerson's quest is to become involved in his children's lives. His efforts grow to a consistent involvement that leads to greater awareness of his family's heartland. Jon Emerson sacrificed to remain involved with his children. Then the challenge was to stretch, and to remain consistently involved in his childrens' lives, so he might become more aware of what it takes to find, and remain in his Family's Heartland. No longer the father, and arrogant legal professional and sovereign over meaningless relationships, Jon learns from friendships with ‘Bug Dog’, ‘Chilly Belly’, ‘Lutza’, ‘Speedy G.’, ‘Abra’, and ‘Dana’ that to remain involved, is the most important aspect of family life. Jon Emerson, a fallen ALPHA father once involved with his daughters, Sandra, Emma, and Anna, soon learns of his less than perfect, and inconsistent performance as a man, father and husband. With the inspiration of a coffee mug from the X-31 Electronic Flight Management program, a gift to Jon from years gone by, he and his daughters grow to learn they have all caught and taught as Jon performs some rather awesome and determined EFM … or, as his girls call it, Exceptional Father Maneuvers. Author's Note: Mr. Nightingale purchased 'ANNT: Axiom I & II' from Audrey's Books, a local Independent bookstore. He is a self-described 'less than technological fellow' who -incredibly- still uses a rotary dial phone. Mr. Nightingale read this Bio-Social Science Fiction novel written for both Young Adult and Adult readers. He then surprised me when he handed me the above typed Book Review. Danta exposes Mantid Tranquil and disrupts its maneuvering to exploit The Innocents. Empowered by those from other dimensions, Danta honors his commitment to war against Mantid Tranquil and chooses lesser evils to defend The Innocents and, to overcome Mantid Tranquil's more than personal attack upon The Innocents, and then his closest family. The Lake People Publishing Group is proud to extend an early draft 'Cover Reveal' for The Awareness of Emerson, third novel in Bestselling Author, G. Mitchell Baker's Emerson Series. Not only has the Author written yet another character and values rich story in Contemporary Fiction. Much to our Art Department's surprise, he has produced stunning Digital Artwork for the book cover. His original work, entitled Vibrant Guitar No. 1 was selected as the feature of the front cover. ​Lake People ... The Lake People Publishing Group is anxious... Why? Bestselling Author, G. Mitchell Baker is writing the third novel in the Emerson Father Friendly Family Fiction series. The working title of this latest novel in series is The Awareness of Emerson. Not only is Baker writing his character rich story, much to our surprise, he is producing artwork and ideas for the book cover. This original work, entitled Vibrant Guitar No. 1 is but one example of the artwork recently submitted by Baker. 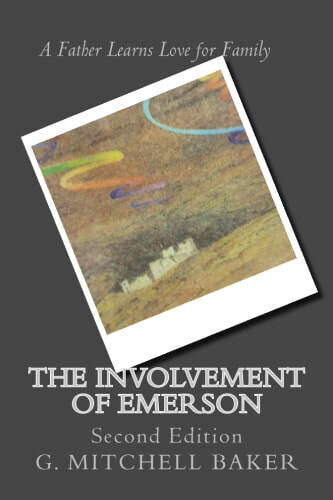 Now, we at The Lake have no idea whether the cover for The Awareness of Emerson will incorporate this artwork, but we are certainly enjoying the sharing going on here! Here at The Lake, we are looking forward to this new release coinciding with the Words In the Park Book Fair and Sale that is part of the Alberta Cultural Days and co-hosted with the Arts & Culture Council of Strathcona County (October 1, 2016, Festival Place, Sherwood Park). Indeed, this latest Father Friendly Family Fiction release may well contribute to the celebration of all friendly culture and community... Here at The Lake, we can't wait to find out what stories Baker has to tell, in this latest installment of literary family fiction... Cheers! A Science Fiction Series for Young Readers Who Think They Have All the Answers to the Super Questions. ANNT: NEoCLEAR I & II is a Series of Adventures in Science Fiction. Given the ongoing competition between old Mother Nature and Adaptable Neo-Nature Technology, will Terraca's gift of NEoCLEAR provide NEoENERGY to fuel ANNT and to favorably alter the Earth's systems and the function of the World? Race along with Doctor NIles Gens and Doctor Austina Doceo, to learn more about their response to these, and other Super Questions. 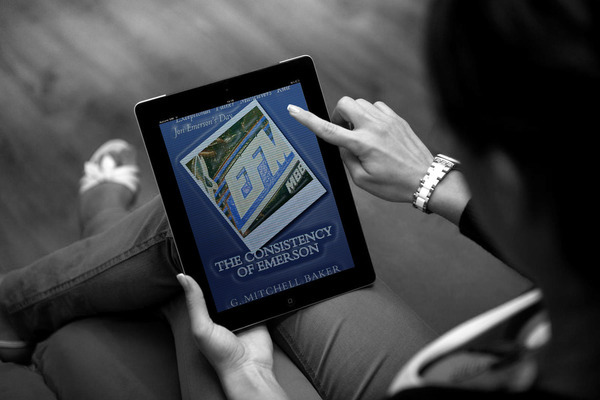 So looking forward to Jon Emerson’s continued journey in Baker’s second book of the series: The Consistency of Emerson. The Lethal Believers Series is gritty, edgy fiction that blends paranormal and mythical elements into powerful storytelling of motivation and mystery. Malachi Danta-Mercadel searches out and battles Mantid Tranquil in the darkest spaces. Empowered to defend The Innocents, Danta partners with figures from Greek Mythology and knowing creatures from all dimensions, to find Mantid Tranquil hiding deep among the Cave Ravens. To dismantle the corrupted association of predators once and for all is all Danta, Lamia and Hesiod will settle for in the course of protecting The Innocents. Adaptable Neo-Nature Technology or 'ANNT' is a series of character driven Bio-Social Science-Fiction novels in near future. The stories invite and challenge young readers to consider for themselves the prospect of ANNT competing with oMN for the essential role as 'Default Nature Provider'. Will the competition lead to better the Earth's Systems and preserve the Function of the World ... Who knows...? I leave it to the young minds out there to take on the challenge themselves, develop their own basic assumptions, and, work to defend their vision of a better and perhaps best future..."
Will ANNT or old Mother Nature better manage the Raca chaos? ​"Every once in awhile you come across a gem of a human and your life is enriched in a whole new way. Master Koda Select Publishing had this experience when they were introduced to G. Mitchell Baker. He is a terrific writer – and even more important than that, a great friend. We have found that he is super supportive of all our other authors and jumps in to lend a hand whenever he can. Today we take the opportunity to give him the spotlight. We hope you enjoy getting to know him a bit better." Stories about our future, our science, our technology, our government, our society that encourage readers to think, perhaps Systems Think about possible solutions to problems in our inevitable, contemporary near future. I purchased ANNT: Axiom III & IV ... again a great two-for one value and offering of two novelette for SCI-FI readers beginning about grade 5. I just finished these reads and the characters are strong and well-established. There is Dr. Niles Gens, the practical physicist, geneticist and engineer. And there is the passionate Dr. Austina Doceo who specializes in other science to include biology and nano-technologies. They are on their journey to solve the world's problems at 14 years of age and we follow them through the adventures that involve hard science, technology, governance and the impact this all has on society. What is really intriguing is that now there are also the ANNT characters to learn and follow. In ANNT: Axiom I & II there were the likes of SINO-ANNT, FRENCH TACTICAL-ANNT, PROTO-ANNT 72, TRACK-ANNT, DETON-ANNT and SAFESOUND-ANNT. In ANNT; Axiom III & IV there is CONSERVE-ANNT, WEAVER-ANNT, the all purpose TETRA-ANNT, URBANFORCE-ANNT and ERADO-ANNT... so much more. The stories range from saving wild elephants in Africa from poachers, to eradicating the source of illegal drug supplies all around the world (in one operation). Incredible problems and solution for young readers to consider, perhaps imagine in their own worlds. I see the author also is involved in the artwork for these books and it all seems quite amazing. Again, I hope there is more in store because I believe these books will ignite the imaginations of young readers not only to entertain, but provide a challenge to come up with as good, if not better solutions to problems in this world than Dr. Gens, and Dr. Doceo. As a Special Ed. and Elementary teacher for 36 years I could have really used this kind of material to get my kids excited and thinking about the world around them. This ANNT Series needs to be in libraries and schools. I gave this story five stars because I could feel the plight of the father through the colorful descriptions the author uses. Baker describes the father's experiences after losing all his material possessions. His three daughters remain his only true and meaningful connection forever. I experienced all Jon's trials and tribulations while he manages to maintain a satisfying relationship with his daughters as a means of survival. Like me, readers will feel Baker projects compelling insight into a most contemporary issue. There is PROTO-ANNT 72, TRACK-ANNT, DETON-ANNT and SAFESOUND-ANNT... This ANNT Series needs to be in libraries and schools. Post tornado, the Soccer Tommies and Baseball Mommies compete for home field advantage. Is it ‘Win-Win’ or will the community continue to Come Apart? "Teachable Moments in this latest #Kidlit..."
Published in eBook, Paperback and with feature length Screenplays sometimes optioned for film production, Baker has enjoyed working with Master Koda Select Publishing, NEoNATURE Publishing, and The Lake Publishing Group. From within each genre Mr Baker finds an interest for writing with a purpose and foundation in social value, to include a sense of family, community, and, while exploring the kind of responsibility essential for defining a lively and thoughtful community. 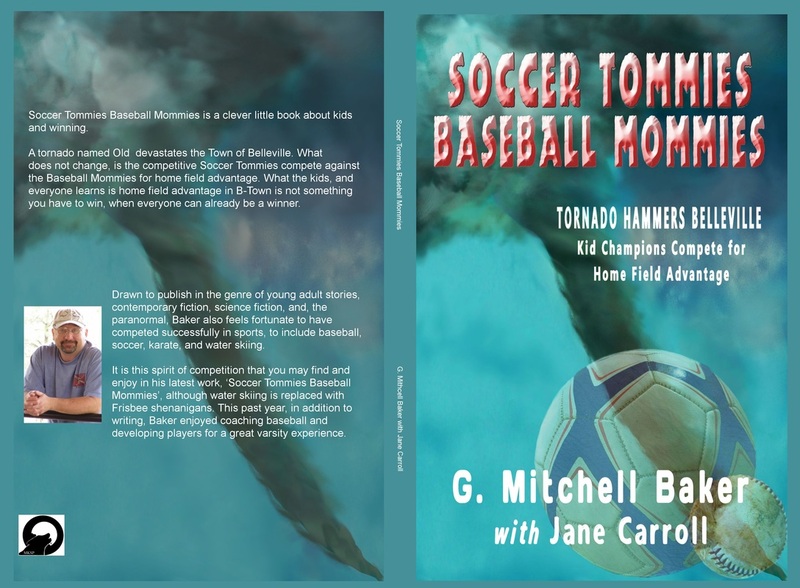 Welcome to the Website of G. Mitchell Baker, Author. We hope you enjoy your visit and you will visit time and time again in your effort to keep up with the energy and imagination Mr. Baker brings to his well-read stories. Please visit the “Author's Excerpts” located either under the 'About Author' tab or by pressing the Button below.